When you or your child is considering taking dance lessons in Alberta, you’ll want to find a dance studio that fits your needs and expectations. After all, finding the right dance studio can mean the difference between taking a few lessons or becoming a life-long lover of dance. When looking for the right dance studio, consider these ideas. What Does The Staff’s Background Look Like? Any dance instructor should have a deep commitment to education, safety, and professionalism. They should also be experienced dancers themselves. Think of it this way, your cousin Steve might shake a mean samba, but he probably shouldn’t quit his day job to teach. We take our time to find the right instructors to teach our dance lessons. Star Bound Dance Company has been working with some of the finest instructors in Alberta since the 1990s, and it shows. Each of our instructors has worked closely with our studio for many years, and all have a successful dancing career outside of teaching dance lessons. Our students quickly become some of the best dancers in the area! 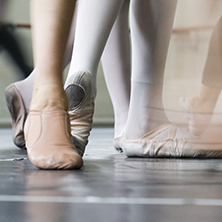 Taking dance lessons is more than just hopping around a room while moving your arms. Dance is a demanding and technical form of performance art. The right dance class should feel challenging but still fun for you or your child. It should teach the fundamental elements of terminology and movements while expanding on more complex techniques and sequences. The best-designed dance lessons are the ones that perfectly balance fun and creativity with challenge and accomplishment. Leaning in a class environment is fun because it’s an opportunity to make friends, and develop a sense of teamwork. However, classes with too many students can mean that some students are left behind, or get lost in the crowd. You or your child might not get the one-on-one attention and coaching needed to nail a new move. Smaller class sizes mean that no one misses any fundamental concepts. It also lets instructors monitor the progress of each student to make sure they aren’t developing any poor habits or troublesome techniques. While rehearsals and practices are a lot of fun, nothing quite matches the exhilaration of performing in front of an audience. The best dance studios end a semester of dance lessons with a performance or review. This might be at the studio itself, or at a nearby performing arts center. Either way, you’ll want to show off your new dance skills to your friends and family, so ensure that your dance studio arranges for a performance at some point during your lessons. Taking dance lessons should be a fun and rewarding experience. That’s why we’ve been a fixture in the Alberta dance community for more than 20 years. We offer dance lessons in a variety of sizes and for nearly any skill level, from beginner to advanced classes for your child, or even for your first dance classes as an adult! Come visit Star Bound Dance Studio; we’re sure you’ll see that we’re the right dance studio for you.